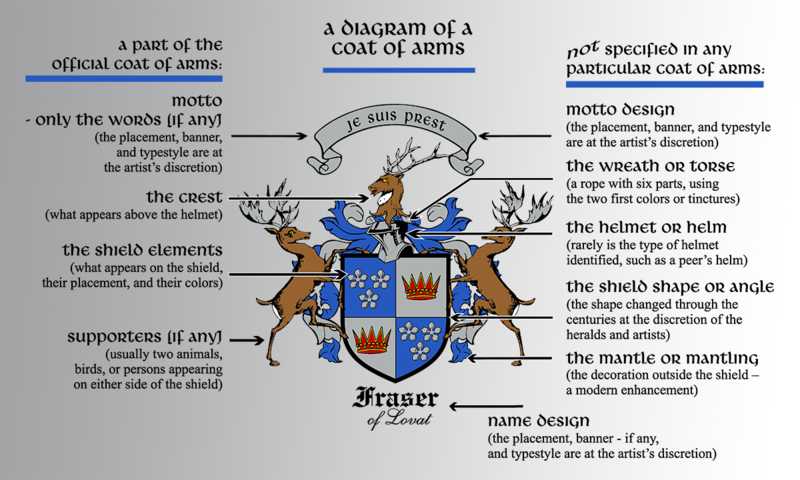 Formally known as an achievement, armorial achievement, or heraldic achievement, what is commonly referred to as a "coat of arms" consists of several parts: the shield, the mantling, the helm, the wreath, charges, and the crest (note that not all arms have crests). 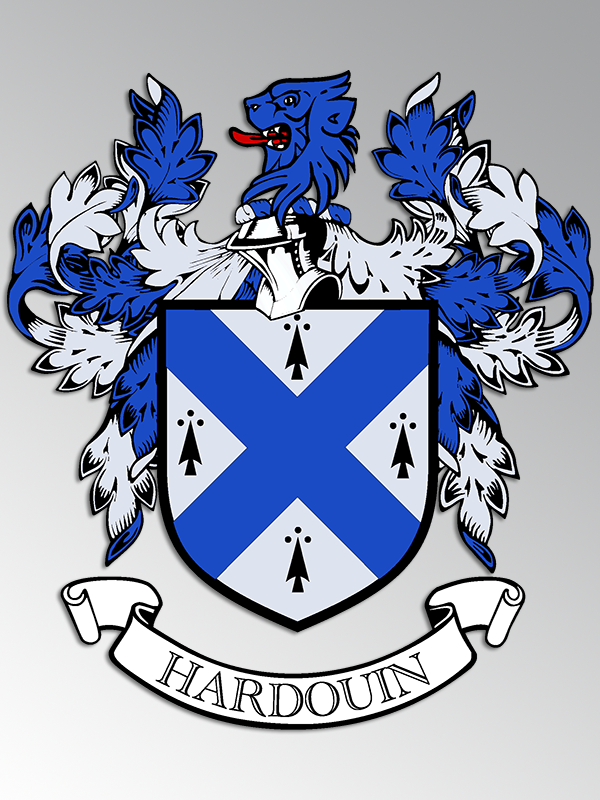 The official, written description of the coat of arms is called the "blazon of arms," such as "azure, a fess argent between in chief two fleurs-de-lis and in base a lion passant of the same." The blazon may seem like a foreign language, but it is simply a system of code words to denote colors, placement, and styling by using an economy of words. 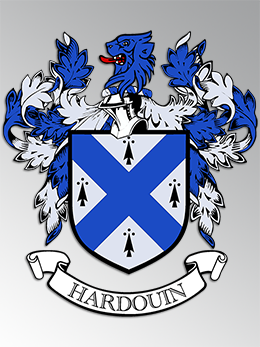 Much of the design for a modern depiction of a given coat of arms is more the artist's preference or the style of a particular herald, and not a part of any particular blazon. 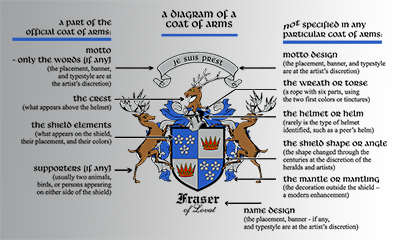 The mantling and the banners for names and mottoes, for example, are not an official element of the blazon of arms. The helm, likewise, is not a part of the official blazon. Some historians attach a significance to the design of the helm or helmet as representative of a certain century or social status, but there are differences of opinion on this matter. Shield: The colors and charges (lions, designs, etc. 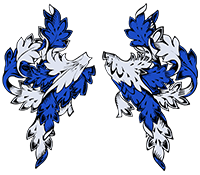 that appear on the shield) are a part of the official blazon, but the shape of the shield is not. Shield shapes vary according to the geographical origin as well as the time period. Helm/Helmet: Not a part of the official blazon, the helmet varies with the bearer's rank, the century represented, or the herald's or artist's preference. Wreath/Torse: Not a part of the official blazon, the wreath (or torse) usually consists of the primary color and metal. 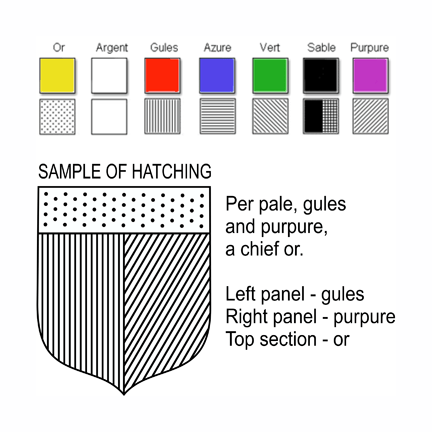 Mantle/Mantling: Not a part of the official blazon (except that sometimes the colors are specified), the design varies with the herald's or artist's preference. This is said to represent the cloth that hung from the wreath and protected the back of the head and neck, even though it may often be depicted more like the leaves of a plant. Can I see some examples of your design work? Of course! Please see our portfolio and pick some examples that you would like your design to emulate. What if I want to have the design embroidered on clothing and accessories? Why do some coats of arms have lines and dots? This is called "hatching" and was used by jewelers and other artists when color was too expensive to use or unavailable. 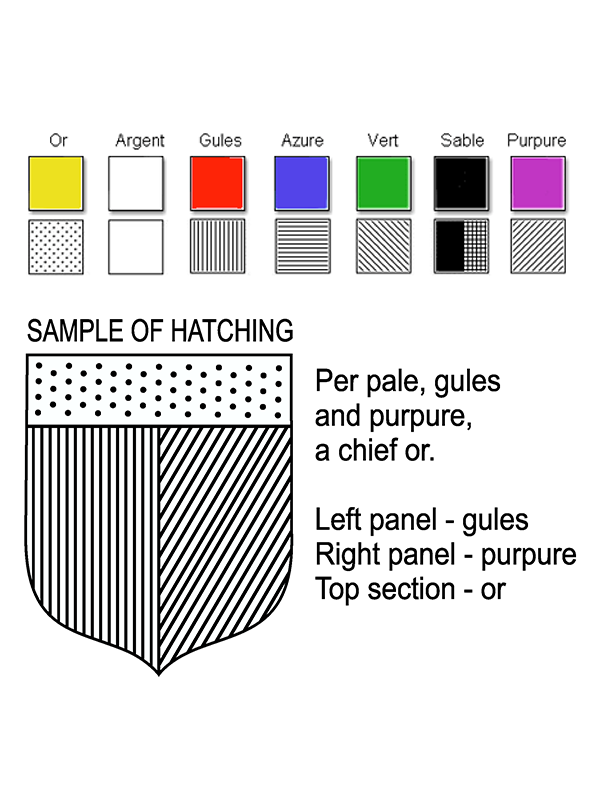 "Hatching" is the term for representing the colors of a coat of arms in black and white. This was necessary when color printing was excessively expensive. "contact us" or "send files" links. Copyright © 2019 fleurdelis.com All Rights Reserved.